Twenty-first century libraries are places of exploration, innovation, discovery and learning. They are places of engagement and connection and community. They transform lives – every day! Imagine the brilliant power of our library. It nurtures the skills children need to develop in order to become good readers. Adults access lifelong learning resources – learn how to bake a cake, write poetry, learn a language, play a drum and more. The Library helps a veteran write a resume, brush up on interview skills and apply for a job. It helps a senior choose a Medicare plan and apply for Social Security. It gives those on a tight budget and those interested in diverse cultures the ability to enjoy drummers from Puerto Rico, dancers from India and more opportunities for cultural participation and enrichment. Families find a welcoming, safe place to participate in story times (in English and Spanish), arts and crafts, 3D printing and Lego building. It gives a newcomer a sense of our community and history and a place to meet people. It gives people of all ages a perfect opportunity to volunteer and find meaningful work. The library is both a sanctuary and a community center. It is the soul of our community and it is the most important place in town. Libraries bring people together and nurture engagement. They provide a sense of place – of belonging. Libraries strengthen our community and add value to it – economically and socially. It doesn’t matter who you are or what your background, the library welcomes you and has something for you. This will be a library to be proud of – our community living room. You probably know that the old branch closed in spring of 2018 and was demolished in November of 2018. The City of Capitola is making steady progress on construction of the new building. 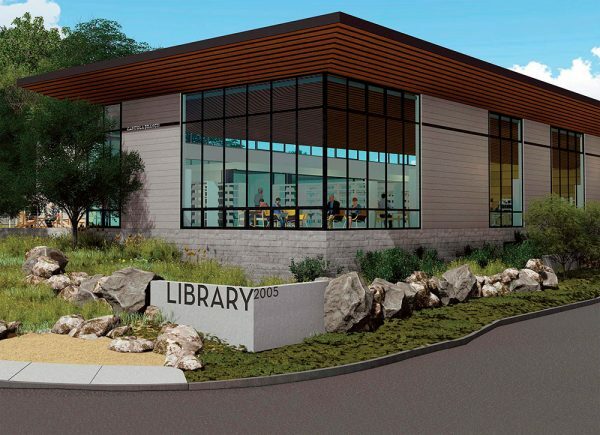 On June 6th, the City of Capitola opened three bids that had been received for the construction of the Capitola Branch Library. The lowest bid, from Otto Construction, came in $2.3M over the amount budgeted for the construction. Based on this, City staff and the project manager developed two recommended options for the City Council’s consideration. On July 26th City Council voted 4 to 1 to accept the option to award a contract to Otto Construction to build our wonderful new library. City staff negotiated changes order Otto Construction based on value engineering (cost reductions identified by city staff, the architects, and the project manager). These changes did not affect the size or the library programs and operations that will be delivered from the new branch. The look and feel of our new library remains the same. We will still enjoy natural light, ample space for flexible rooms and reading areas, a community porch, the community meeting room and much more. Some very good news in the fall of 2018 was that City staff identified additional construction funding from Measure S due to special library tax revenues having exceeded estimated amounts. When the cost reductions and additional funding came through as planned, the City Council chose to build the library as designed. This design has been extremely well received by the public and is based on numerous community inputs as well as library staff knowledge of current and future needs of a 21st century library. It also drew upon a needs analysis and a Facilities Master Plan conducted by library consultants. The Capital Campaign Fundraising Committee used this current design to conduct the Quiet Phase of the fundraising campaign – talking with community leaders and library supporters and obtaining lead donors. This has been so successful that the committee has exceeded its total fundraising goal while still in this Quiet Phase. The Fundraising Committee is planning to kick off the Public Phase of the Capital Campaign at groundbreaking. The Fundraising Committee kicked off the Public Phase of the Capital Campaign at the groundbreaking held on November 9th. There are several ways you can participate in donating to and supporting our new library! Click on the green DONATE/PURCHASE A PAVER button (above) for more information. The Capitola Branch (one of 10 branches in the Santa Cruz Public Library System) serves people from throughout Santa Cruz County. For its size and staffing, the Capitola Branch is one of the most heavily used in the entire system and is an important asset to our community. Our library is currently housed in six bolted-together portable modules, a 17-year-old structure that is timeworn, outdated, and undersized. The time has come to create a new 21st century facility designed to be flexible enough to serve the changing and innovative uses and needs of our community. Additionally, Capitola has signed an agreement with the County of Santa Cruz to build a library by 2019. In 2011, a Space Needs Assessment was conducted to determine the best size and services needed in the new Capitola Branch Library. What does the new library cost and how is it being funded? The cost of the project is estimated to be $13.15M. Funding comes from: $2.665M saved by Capitola from redevelopment (RDA) funds over 17 years; $8M from Measure S, $2.135M from City of Capitola, and at least $350K from Friends of the Capitola Branch Library, through contributions from the community. The remainder of the project funding will come from the City’s General Fund. The $13.15M cost includes construction, design, site costs, (e.g. demolition of the existing facility, site preparation, the parking lot, landscaping and ground water recharge), as well as furniture and equipment. These estimated costs are consistent with other recent public buildings. The final project cost will be determined based on the actual project bids submitted by contractors in the public bidding process. Why isn’t the Measure S funding sufficient? Capitola received $8M, a percentage of the Measure S funds, based on county-wide negotiations, not on our needs. How was the size of the new library decided? Our current library is 4,000 Square feet. The new library will be 11,700 square feet. The Space Needs assessment, conducted by a consultant, called for a 12,841 square foot library. It was decided by the Capitola City Council to build just under that size based on the funding available for the project. When you expand the library, will there be enough parking? Ample parking (39 spaces) have been planned in the lot and there will be four 20 minute parking spaces for quick pick ups or drop offs on Clares. How many bicycle parking spaces will there be? The plan is for 10 racks that will provide 20 bicycle parking spots. What will our new library look like? The contemporary style building is designed by Noll & Tam Architects, an award-winning team from Berkeley who have designed numerous libraries. See the current drawings. 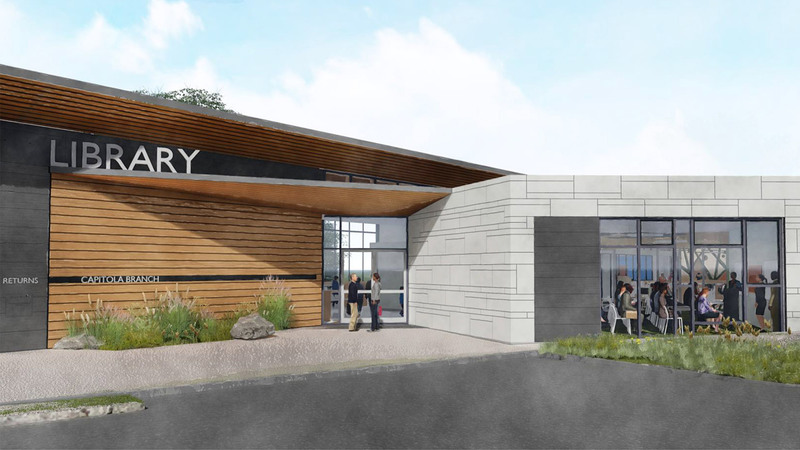 What new services will our new library bring to the community? An expanded children’s area, new teen room, study/meeting rooms, large community meeting room, several quiet reading areas with comfortable seating, expanded Wi-Fi with laptops that may be checked out, fireplace, a comfortable front porch and public art are planned. With these additional spaces, a diverse set of programs, designed to meet the needs of the community, will be delivered at the branch. What will happen to library services once the library is closed for construction? The existing library was closed to the public on Sunday, April 28, 2018. During construction, Santa Cruz Public Libraries will be offering expanded hours and services at the Live Oak and Aptos Branches. There will be a book drop-off box installed at Jade Street Park. In addition, the Library plans to hold its Friday preschool story-times program at the Porter Memorial Library in Soquel. The Library has also partnered with the Museum of Discovery in the Capitola Mall to offer an afternoon “Make & Explore” class for kids and tweens. During construction people can check this website or our Facebook page; or visit the City of Capitola website for current information. Who uses the Capitola Library? Children, teens, veterans, seniors and thousands of people from all over Santa Cruz County use our branch because of its proximity to 41st Ave. and abundant parking. There are approximately 15,000 visitors a quarter at the Capitola Branch, making the Capitola Branch one of the busier ones in the system. How can I stay informed and support our new Library? Attend the Friends of the Capitola Library meetings to get involved and stay informed. Sign up for our mailing list to stay updated on meetings and construction progress. Visit our Facebook page (Friends of the Capitola Branch Library) and like us to stay informed and learn more about the library. What is the plan for public art? The City will put $80K from the construction budget into the Art Fund (that is based on the amount of unrestricted City of Capitola General Fund being put into the project). The plan is to develop an Art Fund funded project for the ceiling in the Children’s Room. What will happen to the Tot Lot? The Tot Lot will remain on the site. Due to safety concerns, it will be closed during construction.